Warum tanzt er/sie nicht mit mir? Chacarera is one of the most famous folklore dances of Argentina. 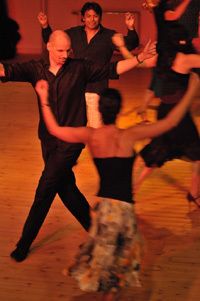 Unlike tango, chacarera can be danced by most people in Argentina, especially in the countryside. People dance it a lot during fiestas and also as a break at many milongas. It is fun to dance and very easy to learn. It only takes one workshop of 1.5 hours to master chacarera! Chacarera is danced in couples but without embrace following a given choreography. All couples line up facing each other. The basic idea of chacarera is courtshipping each other in order to find together in the end. The rhythm of chacarera is a 6/8 beat which can be counted as a 3/4 beat as known from the vals beat. Whereas the speed and rhythm of the chacarera can vary a lot, the structure is always the same. A chacarera consists of two identically parts. * marks the clapping, the numbers in brackets are counting the vals-beat rhythm for dancing. After the introduction sequence you may hear "Adentro" in most chacareras indicating the start of dancing. 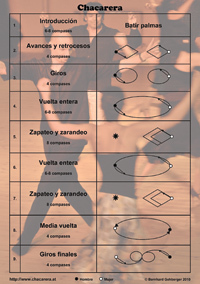 From then on you follow a given choreography, an illustration of which you see on the top of the page. There is only one tricky little moment to watch out for. Depending on the chacarera song being played, the figure "vuelta entera" has to be danced in 6 or 8 beats. Normally it's possible to hear this already during introduction sequence. But since the introduction might be cut or difficult to hear you will have to figure that out by yourself. In Europe sometimes the DJ, a teacher or an experienced dancer might tell it in advance. Otherwise it's not difficult to recognize it by the melody of the music ending within 6 or 8 beats. Since everybody is dancing the same choreography you can always simply copy your partner or other dancers near by. After the first part of the chacarera, the whole routine is repeated, starting with the introduction sequence, clapping and the choreography. Even if you have never thought of dancing chacarera - give it a try! It is not at all as showy as it seems to be, since you are supposed to courtship your dance partner and be with him all the time until finding each other in the end. A variation of the chacarera described above is the chacarera doble. Regularly danced in Argentina you will hardly hear it in Europe. Basically the same as the normal chacarera, but with some differences in the choreography where some figures are repeated. Again you have to distinguish between a 6 and 8 beat variation. Illustration of the choreography.